Calculate the average weighted GPA of multiple courses with this Weighted Grade Calculator. 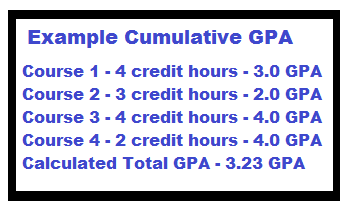 Fill in the credit hours and GPA of each class to determine the total weighted grade of the semester. If you took fewer than 6 classes, leave the remaining boxes blank. What is a Weighted Grade? In many college, and some high schools, different classes carry a different "weight" or value of "credit". Many times, classes have a value of "credit hours". You may refer to your semester workload as taking a certain amount of credit hours. Like, "I'm taking 18 credit hours this semester." Those 18 credit hours can be made up of multiple courses that carry a set amount of hours per week of class time. For example, the total of 18 credit hours could be made up from a chemistry class worth 4 credit hours, a geography class worth 3 credit hours, a math class worth 4 credit hours, a literature class worth 3 credit hours and a shop class worth 4 credit hours. What grade you receive in each class is combined and adjusted based on the credit value of each class, to come up with a cumulative weighted grade. How to Calculate College GPA, or High School GPA? 1. Multiply the GPA and credit hours of each individual class. 2. Take the results of step 1 and add them all together. 3. Divide the total sum from step 2 by the total credit hours taken for the semester. Keeping track of your GPA in High School, or College, is one of the most important things a student can do. Knowing how to calculate GPA and how to find cumulative, or weighted GPA based on the amount of credits a class has and the total GPA score of that class can drastically affect a student's final GPA. By utilizing this GPA calculator either as a Weighted Grade Calculator, or as a Cumulative GPA Calculator, you can track your progress and help predict what goals you need to set to achieve your target Grade Point Average.